I have drawn this mission twice. Both times went well for the first few minutes and it would have been an easy completion (Typhoon), however after a few minutes my screen, keyboard, and mouse locked up and stayed locked up until I was in a pod. After that gameplay returned to normal. This has happened to me on both attempts at this mission approximately 1 month apart and both in Gyng system. A GM told me there was nothing out of the ordinary on the server logs. I was curious if anyone else has experienced this, and if so to warn others of this possibility. My second account running at the same time in a different system was unaffected so it wasn't my machine or connection. As of now I would be very reluctant to attempt this mission again as losing a ship both times was rather upsetting, considering I was easily beating the mish up to the point where I could no longer target or fire. Pocket 2 completely aggroed within a minute of my first shot. From my approach the left and right groups looked like one big group, so I targeted a Cruiser that was towards the right side, with the above result. They were faster than my Hype so it was iffy for a while, but the tank/cap held up. Next time I'll fit an Afterburner. You always get the whole bunch, no matter what group you take on first. I got the frigate group first and let my medium drones take care of them. then fired a single shot at the far most right cruiser and only got 1 group. Mission easily completed using a shield tanked Sleipnir with autocannons, an AB and 2 hardners and kinetic explosive. The mission is both blaster and rail-gun friendly for hybrid users. No tracking mods needed, Webb will make it extremely easy. Second room agroed on my first shot. Also - distribution of enemy ships not even close to what is described. The gate to Pocket 2 has been moved close to your warp in from the first gate so you don't have to bring a book for the trip. Updated the page to correctly reflect changes in new patch, should be correct now. Easily done in a Tempest, armor tanked. 2x Exp hardeners, 2x Kinetic hardeners, Fusion L ammo, Named Large repper. Didn't even get past my shields as I was flying around. i attached the lefmost group in pocket 1 and every group except the 3x cruiser group far right aggroed. In second pocket I aggroed frig group and other groups did not aggro. When I aggroed center group every group aggroed. In pocket 2 a Gistatis Praefectus is stuck on an object in space every single time at 92km or so. Took 54 volleys with 800mm AC and Barrage L to pop him. 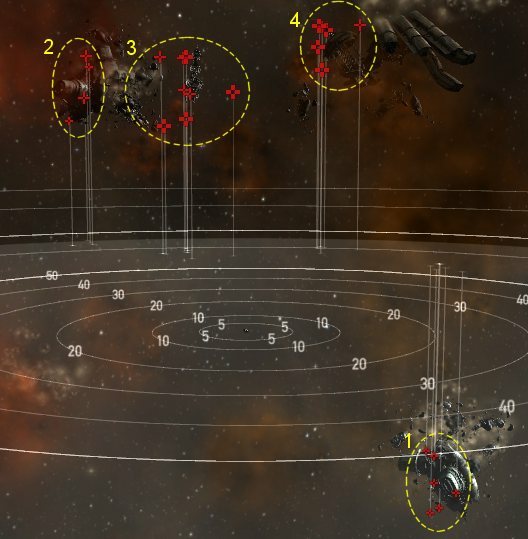 Does CCP act on complaints about such? One would think they have had plenty of time to put a fix in so rats don't get stuck. I am also having the "freeze" problem in Attyn. Two freezes before I completed the first gate. I immediately turn computer off and have managed to save ship each time but 5 drones have met an untimely death. I dont seem to remember this happening before Apocrypha and upgrading my graphics package. confirming no stage aggro on either frig, or right groups, in room 2. Pocket 1: Got agro from whole. No problems in a rokh with T2 stuff. Pocket 2: Followed the guide. normal/hard difficulty. BS's hit very hard if close. hmm, my apoc is cap stable, but still my cap drains pretty fast.... are they neuting? Simple in a 3x Large Shield Extender Drake, though a bit slow. All groups aggro entire pocket in 1st pocket. 2nd pocket seems to aggro randomly, but down right and back right do not aggro pocket ever. Pulled stage aggro in both rooms...turned my SB on once for about 30 secs after clearing room 1. In the first room I initially drew aggro from center front group and right rear group; had to run my repper for a bit. After taking care of the cruisers and frigates I speed tanked the BSs, shields hovered around the 40-60% mark. Center rear group was no problem - shield/speed tanked everything. Gistum Crusher target painted me. Final group of cruisers and BCs had me into armor again but didn't threaten my tank at all, only needed to pulse my MARII a couple of times. Lower right group of frigates was no problem of course. Then drew room aggro. Ran the repper pretty much continuously until the cruisers and BCs were gone, ran low on capacitor at one point due to using the AB the whole time. Then shield/speed tanked all the battleships. Overall very easy; didn't destroy the battleships as fast as I would have in my Abaddon, but the Legion was way more fun to fly. Can't comment on pocket 1 as I managed to aggro the entire room. Killed off Group 1 first. I can confirm that attacking Group 4 did not draw aggro from remaining groups. I used the Gist Commander as an initial attack to distinguish the group. Confirming aggroing Group 4 did not draw aggro from remaining groups. I then proceeded attacking Group 2, and this draw aggro from Group 3. Group 1 (frigates) never aggroed, and I simply ignored it as it's not needed for mission completion. Overall a very easy mission, T2 Cruises Raven, never got below 60% shields. I tried it out several times and it works everytime. This one was easy for me on my Maelstrom, compared to other lvl 4's. Pocket 1: went a bit to the left, attacked the left group. Middle group got agrood a bit later on but they moved very slow. Left group was gone before the middle group was in my range. Watch your drones though, I lost one when the whole middle group targeted them. Did receive practically no damage. 10.8 M Salvaging, 2.7 M drops, 7.3 M bounty. Also, confirm that aggroing rightmost group in pocket 2 does not make anyone else aggro. I shield tanked with a Megathron (Invulnerability Field II, Ballistic Deflection Field II, Explosion Dampening Amplifier II, Large Shield Booster II). I did not loose any Drones. On pocket 2 (after the second accelleration gate) I had to warp out once to rep. So ensure you target and destroy all the frigs first. Pocket 1: Shot for the right most group, and got aggro from the closest groups. The back left and back middle did not aggro. Pocket 2: Grabbed the frigates with no issue, then the right most group with no extra aggro. All in all, easy mission, just had that little hitch at the start. Aggro is random, maybe? Easy Afk in passive shield Ishtar. Agg the room, release the drones, go have lunch..
A t1 fit passive drake (LSEs, 10mn ab, hml, etc.) can take stage aggro from both rooms, as long as you can manually pilot well and know how to manipulate transversal velocity. Room 1: Group 2 and the solar array nearby have been moved to the inside left of station (long ago if I remember right). Crept up within 34km of them from beacon to start room. However Group 1 then aggros after first kill. Shooting group 4 later from that position also aggros Group 3.